I've been waiting for over a year for the announcement. I've kept abreast of all the rumors. I have a saved Google News alert for "iPhone 5." And now that the announcement has been made and the iPhone 5 is set to release next week, suddenly I'm all "meh... Guess I can wait two years until the iPhone 6 comes out." Don't get me wrong. The iPhone 5 is clearly impressive and has a number of long-awaited improvements. For me, however, this is a clear case of "too little, too late." When the iPhone 4S came out last year, my immediate reaction was, "Are you shitting me???". Seeing as Apple pulled this "ha ha! We're not really releasing a new model even though you have been waiting a year" game on us before (3GS, anyone? ), I should have not been surprised. Yet, I still was. Yes, the camera was improved, and there's Siri; but when you really break it down, there's not that much of a difference between the iPhone 4 and the 4S. And thanks to the incremental steps put forth with the 4S (not to mention the iPad 3, which has some but not all of these "revolutionary" changes in the iPhone 5), what should have been a mind-blowing, game changing announcement was just "Okay. Sure." There is not enough of a change in the iPhone 5 to make me jump and plunk down $400 (I'm a 64 GB kinda gal). Bigger screen? I have an iPad 3 with an even larger screen, which I bring everywhere. Retina display? iPad has that too. Panoramic pictures? I don't need them, and the iPhone's camera is still worse than that of other smartphones (like the Nokia Lumina or Samsung Galaxy), so it's not replacing my real camera any time soon. Siri, new maps, iCloud tabs, Passbook, photo streaming, Facebook integration?? It's all coming to the iPad with the update to iOS 6. Look, I'm not saying the iPhone 5 isn't impressive. I'm just saying its not impressive enough to get me to make the jump. What about all of you? 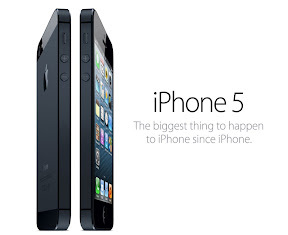 Are you sufficiently impressed with the iPhone 5, or will you be holding on to your current i-devices? In keeping with our vow to the Mom Pledge, all comments will be moderated for tone. Any comments made outside the spirit of that Pledge or any comments made to invoke a reaction outside the scope of that Pledge will not be posted. This MONTH I'm Loving... Fall Returns to TV! !